Sliding on ice is often a scary and frustrating situation. 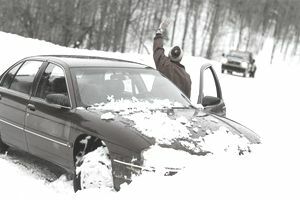 Many drivers feel they are driving cautiously for the road conditions but still cannot maintain control of their vehicle. Sliding on ice can cause a lot of damage. Damage can occur in many different forms. After a sliding on ice accident, ​many people are left wondering if their car insurance will cover the damages. Will your selected car insurance coverage be enough? Take a look at how each type of damage would be covered. Let's get one thing out of the way real quick. If you slid on ice and hit another car or any object for that matter, it is definitely considered an at-fault claim by your insurance carrier. It does not matter if the police officer let you go without a ticket, someone is at fault, and it's not going to be the ice. Driving too fast for conditions is usually the given reason. Sometimes it doesn't even matter if you were driving at a snail’s pace: being on the roadway is at-fault reason enough. I did mention, in the beginning, these claims are often frustrating. If another "party" in another vehicle or a pedestrian is injured due to your vehicle sliding on ice, your bodily injury liability coverage will cover the loss up to your policy's listed limits. Limits are listed per person/per accident, for example, your policy may have limits of up to $25,000 per person / and up to $50,000 per accident. Medical Payments or PIP coverage would apply to injuries sustained to yourself and other passengers. Coverage levels will vary greatly depending on where you live and the coverage you selected. Some PIP policies cover lost income, rehabilitation costs, and more. If you are hoping your car insurance will cover the damage sustained by your vehicle after hitting a patch of ice, you had better have collision coverage. Collision coverage would be the coverage you need whether you hit a guardrail, another vehicle, a mailbox, or any other inanimate object. Plan on paying your deductible before any dollar amount is paid out. Property damage liability pays out in most states whether the damage is to someone else's vehicle or a mailbox, or a stop sign. Pretty much every state requires some property damage liability coverage. The lowest coverage amount coming from New Jersey and Pennsylvania with a minimum requirement of $5,000 on property damage. As you can see, the minimum may very well not be enough. Sliding on the ice often results in needing a tow. Depending on how your car insurance policy is set up, it might provide coverage for a tow or the cost of pulling you out of the ditch. Call your car insurance agent to verify your coverage. Sometimes a claim can be filed at the time you need the tow and you can avoid paying any money out of pocket. *Singled Out Again: Michigan residents check out how collision claims and injury claims are handled in your state. Avoiding sliding on ice is sometimes impossible, but there are definitely habits you can get used to that will reduce your risk of sliding around -- and reduce your chances of having to file a pesky insurance claim. Know where and when ice is most likely: At early morning and late at night, the sun can’t melt ice on the roads -- and you probably can’t see it too well, either. Keep a look out if you are driving through a shaded area during the day as well. In addition, bridges are more easily cooled by air passing underneath of them, and thus more prone to freezing. If you do find yourself sliding, resist the urge to do anything drastic. The less you jerk the wheel or pump the brakes, the greater your chances of surviving the slide without hurting others or yourself.